Cross platform network play with up to four players. Variable board sizes. Choose from 12 to 24 columns. Variable number of corporations. 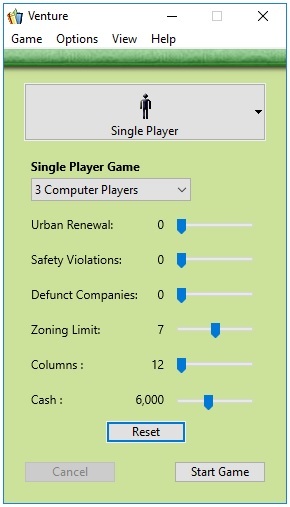 Choose from 4 to 10 corporations to play with. Choose your starting cash for a harder or easier game. Urban Renewal: Help install parks in your city. Disasters: Take shortcuts to quicker profits. But watch out for the accidents those shortcuts may cause. Defunct Companies: Many startup companies fail. Hopefully your company will last. Export game logs as text or HTML. Save initial game setup. 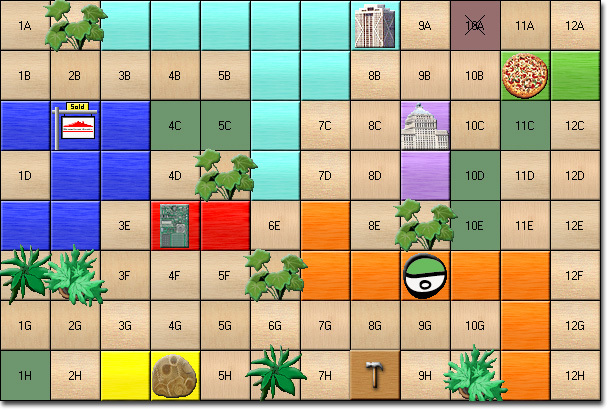 Save the starting setup, including the order in which the tiles will be drawn. Then replay the same game to see if you can beat your previous score. Or challenge a friend to see if they can beat your score for the same game. all while trying to grow your own businesses. The object of Venture is to acquire the most money. This is accomplished by building companies, merging corporations and buying, selling and trading stock. Venture is a stock market simulation game. You start the game with $6000 and 6 properties. Each turn consists of 3 phases. Phase #1: Build a company on one of your properties. Phase #2: Buy stock in any active corporation. Limit of 3 shares per turn. During phase #1 two things can happen. You can create a new corporation or you can cause a merger. A new corporation is formed when two or more companies are started side by side, either horizontally or vertically. You may only form a new corporation if there are less then 7 currently active corporations. When you start a corporation, you will acquire in this computer game one free share of stock. A merger will occur when two or more corporations are connected when building a new company. When this happens, only one of the corporations will survive. The other corporation(s) will be dissolved. The largest company will always survive the merger. If there is a tie for the largest corporation, the person causing the merger will get to decide which corporation will survive. A corporation that is made up of 10 or more companies is considered 'safe' and can not be dissolved. Option #1: Sell the dissolved stock at the former market value. Option #2: Trade the dissolved stock 2:1 for the surviving stock. Option #3: Hold the dissolved stock it hopes that the corporation will be formed again. Each player may use any or all of these options. Condition #1: All active corporations are safe. Condition #2: Any corporation contains 37 or more companies. Once the game is ended, each surviving corporation will be dissolved and all dividends will be paid out. All stock will be sold back to the market at the current market value. The person with the most money at the end of the game is the winner. You can view all of your properties at once by holding down the Shift key. This setting allows you to determine how much land is reserved for parks and other recreational pursuits. This makes local residents happier, but it may affect your bottom line. This setting allows you to specify how careless the employees at each company are. The higher the setting, the more safety shortcuts they will take. In the short term, this may help the bottom line, but in the end, it could lead to devastating results! Many small businesses fail within the their first few years. This setting allows you to specify how fast companies will go out of business. The higher the value, the longer the companies will survive. Setting this value to 0 will disable this feature. Once a company forms a corporation, it is no longer in danger of becoming defunct. Acquire this computer game today. Venture is Copyright © 2003-2019 by Sandy Knoll Software, LLC.